Although carbon fiber has replaced fiberglass as the material of choice for Funny Car bodies, there's not a longtime fan around who doesn't recall Steve Evans hawking flopper shows and promising fans that "the pits will look like a fiberglass forest." Every trend has to have its ground zero, and for the fiberglass-bodied Funny Car, that was Chicago, at the inspiration of Ron Pellegrini and the hand of Chuck Veseley, whose one-off garage-built Super Mustang project turned into Fiberglass Ltd., the first and premier manufacturer of Funny Car bodies from the mid-1960s well into the 1970s. 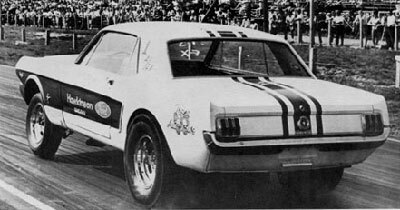 (Above) Ron Pellegrini's road to Funny Car fame began with this Ford Thunderbolt, campaigned for Hawkinson Ford. (Below) The powertrain from the Thunderbolt was later transferred into this successful Mustang. It was a chance meeting at a Detroit auto show between promoter Pellegrini, who had raced gas dragsters for years and even piloted Tommy Ivo's four-engine Showboat, and a representative from Chicagoland car dealer Hawkinson Ford that got the ball rolling. "I had a big racing display there, and he told me he thought he could get some money out of Ford through their dealer-development program and would I be interested in doing some work for them," Pellegrini recalled. "He bought three Hi-Riser Thunderbolts, and I started racing one of them. I was pretty successful with that car, so I told him I'd like to build a Mustang. He got a brand-new Mustang from the factory, and we put the entire Thunderbolt combination in the Mustang and were very successful with that, too, running in A/FX. We won a big race at U.S. 30, won the World Series at Cordova, and a bunch of others in a three-month span. We ran the Mustang at Ford proving grounds because I was hoping that I would get the same kind of deal that Dearborn Steel and Tubing had with Ford, which was to build 100 cars for them, but I never got that deal, but I did get to meet [Ford Racing chief] Jacque Passino. "Over the winter, I was watching what Chrysler was doing with their A/FX cars, altering the wheelbase and using acid-dipping to lighten them. I went back to Jacque and told him Ford needed to build a tube-chassis car with an all-fiberglass body. The decision on whether or not to build it dragged on into 1965, but I went ahead and started booking the car anyway, even though I didn't even have it yet. "They finally came back and told me they didn’t want to do it because the car would be too light and that it would never run good, so I decided to do it myself." Pellegrini took a brand-new Mustang to a local fiberglass shop where, by chance, former schoolmate Veseley was working. They hadn't seen each other in a dozen years, but before long, Pellegrini had drafted his former chum to build the first mold in his home garage. 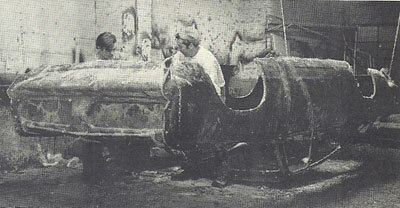 Pellegrini bought the Dennison, Arlasky, and Knox fuel roadster and tucked it beneath their fiberglass Ford shell, and the Super Mustang was created. It didn’t take long for the interest of their peers to be piqued, and requests for similar bodies began to roll in. Pellegrini and Veseley created Fiberglass Ltd. and in November 1965 went into the full-time business of making fiberglass auto parts -- front ends, doors, lids, fenders, hood scoops, plus special projects such as silo caps and even ambulance tops – and it was heaven to Funny Car racers wanting fiberglass versions of their favorite cars. The Mr. Norm team and Arnie Beswick were among his earliest customers. "We had nothing in the bank so to speak of," Pellegrini told Bob Hegge, who penned a story about the company for the June 1967 edition of Rod & Custom, from which some of these photos are reproduced. "We rented some space, had a few hand tools, a couple of hand drills, and some material for glass working. Most of all, we had Chuck's fiberglass knowledge. I knew nothing about making bodies." Workers waxed the inside of a mold for easier removal of bodies. In five months, they had outgrown a 2,500-square-foot shop and outgrew its 4,800-square-foot replacement before finding a permanent home in a 13,000-square-foot shop on Washington Boulevard in Hillside, Ill., in February 1967. They were learning along the way how to build better Funny Car bodies, and the early process was very labor-intensive. "No one had done this before; it was all trial and error," he noted. "Making the first mold would probably take 10 days from beginning to end," he remembered. "First you’d have to clay in all of the cracks so you could pull the mold off, and that alone would take two to three days. You'd have to put clay in the grille openings, the taillights, the molding around the windshield. Then we'd spray it with PBA, which was a parting agent, so the fiberglass wouldn't stick to the car, then you’d spray the gelcoat on it, then you laid the body on it. "Once we had the mold of the stock car, we'd take the front and rear wheelwells out and then put a cap on them [for tire clearance], then relay the altered fender. It took forever, and we were falling behind more and more, and the bodies were heavy as sin anyway with all of the add-on parts, so we decided to make a second mold of a changed body, and that really speeded things up." That process proved necessary when Dodge introduced its new Charger body, which was super-swoopy but also very large and led to the development of the narrow, smaller mini Charger. "We must have cut the Charger body into 100 pieces," said Pellegrini, "and every time we put it together, it never fit exactly right because of all of the compound curves, so we were screwing parts on here and there. Once we got it right, we were able to make a mold. The Charger was so much bigger than the Barracuda that I tried to bring it into the size of the Barracuda. The main thing I wanted to do was move the blower location. On these cars, the blower was under the hood in front of the windshield, so an explosion would lift the whole body off. I elongated the body so that it was more in the windshield area." The duo later got the idea to add phenolic balls, which had been developed during World War II to protect wooden aircraft-carrier decks, into their fiberglass mix to strengthen the wheelwells without adding a lot of weight. Pellegrini and Veseley also began adding foam strips to the underside of the hood and roofs to stop the bodies from collapsing at the higher speeds quickly being attained. 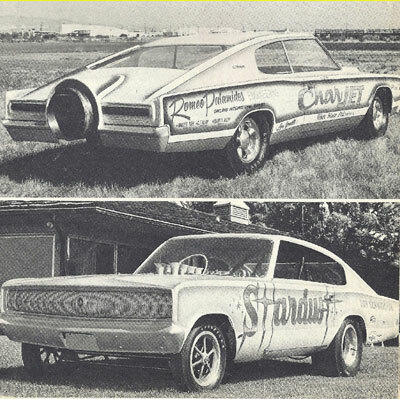 The Dodge Chargers of Romeo Palamides (top) and Don Schumacher (above) were two of the bodies to come out of the Fiberglass Ltd. shop. During this time, Pellegrini partnered with John Buttera and Dennis Rollain of R&B Engineering to form Automotive Research and Engineering to build ready-ro-run race cars, and their customers included Don Gay Sr. and Chicagoan Don Schumacher. "We leased out part of the shop to Acme Coil and Transformer and Schumacher Electric for Don Schumacher to race out of," said Pellegrini. "His dad, Al, asked me to keep an eye on him because the kid was fearless. He had a new Olds 442 that he wanted me to duplicate, but we ended up building him a whole car instead." Business was booming, and bodies – at a now-modest-sounding price of $1,000 apiece -- were flying out the door as fast as they could make them. We were making four or five bodies a week, working a shift and a half to stay up with the demand," he remembered. "Don Hardy used to come and pick up four at a time, and we'd ship to Logghe every weekend." Marv Eldridge's Fiberglass Trends on the West Coast emerged as his only legitimate rival, though "some fly-by-night operators down South" began taking Fiberglass Ltd.'s bodies and making their own molds. "I was getting tired of people just duplicating the second mold; they had no investment in it, no hard work to make the body, but they were profiting from our work," said Pellegrini. "I got so frustrated that I had a Mustang about 80 percent done, but I just cut it up. Before long, Fiberglass Ltd. began focusing on other fiberglass pieces, including a simulated wheel and trunk for a Thunderbird to replicate the Lincoln Town Car look, and that business, Uni-Corp., really took off, too. "We'd make 30 to 40 decklids a day, and I eventually sold that business to a guy who was making grille caps for the same kinds of cars. 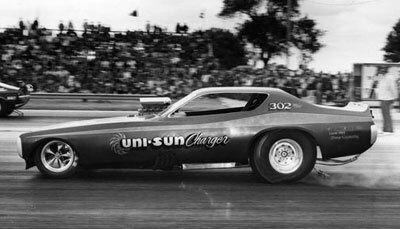 One of Pellegrini's final Funny Car rides was this Dodge Charger, which bannered the newly created merger company Uni-Sun. Pellegrini partnered with that guy, whose name was John Martino, whose parents, June and Louis, were early part owners in the McDonald's Corp. They merged Uni-Corp. with Martino's company, USA Sunroof, to create Uni-Sun, which Pellegrini ran for five years. Martino also had another company, Avanti, maker of radio antennas, which Pellegrini eventually ran, too, and his timing was impeccable as it was during the CB radio boom of the 1970s. "I took it from a $600,000-a-year company to $18 million a year before I retired in 1978. Chicago Funny Car shoe Ron Colson also was an Avanti employee, which eventually led to Avanti's sponsorship of the Colson-driven Hawaiian. Today, Pellegrini, 75, lives with wife Adele in San Luis Obispo, Calif.